OK, so I am not actually starting the garden- planting seeds. But I am ordering seeds, deciding on what to plant and where. I find great joy in this. We are even buying an extra freezer so that I have a place to store my abundance of vegetables I grow each year. I have gotten better and better at pickling and canning my harvest as well. This year we are also joining a CSA- community supported agriculture- and each week I will go to my local farm and pick up a box of the freshest vegetables and herbs they have to offer. I though this will be a great supplement to my garden, it is less expensive that a weekly run to the farmer's market, and, since I just get what they give me, it will make me experiment and eat foods that I don't typically eat. I have been gardening since we moved into this house and I can't imagine it otherwise. Although I get busy and I travel, as long as I plan nothing goes to waste. I enjoy the early mornings picking and eating the freshest food right off the vine. Throughout winter I love to eat what I have saved, knowing that the peppers I put in the stew came from my land just a few months before. This year i am adding some fruit- some blueberries to my garden. That way I can learn to make jelly and jam as well. It is also my first year growing garlic which makes me excited because I love to make garlic infused vinegars. All this talk is just making me itch to get my hands in the dirt. I am going to go off and order those seeds now! I am very excited to have been doing this for 8 weeks now. My Spanish has dramatically improved over the last two months and I see a real progression. I think soon I will start trying to watch TV in Spanish so I can practice listening where the diction isn't perfect and the words a speken much faster than they are on my CD's. This week the lesson is mostly gramattical. The and A, plurals, contractions, possessives, asking a question, and adjectives are covered. This is a week that I really have to concentrate on reading and re-reading the chapter until I understand it, and the CD is sort of secondary. Did I ever mention I got a D in college grammar, it was English of course, but still not my string suit. At least I don't have to diagram sentences! 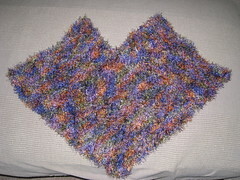 I belong to Ravelry- a wonderful fiber community. A great place to post your projects, keep track of your stash, list your to do, find other artisans and just about anything else to do with fiber that you can think of. I have been lucky enough to find a wonderful community of like minded people there. The group I belong to is called Monthly Adventures because each month it is another adventure. We swap, we have knit-a-longs, we keep each other from being blue, and enjoy each other's achievements. This month one of our swaps has to do with color. We were to research our partner's favorite colors and send them something that was inspired by those colors. 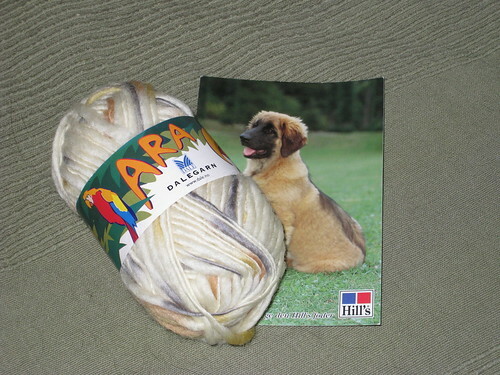 My partner was from Sweden and she sent me a wonderful ball of wool yarn in my favorite- beige! And lastly, I am sure you have heard about the terrible brush fires in Australia. Well artisans have come together and opened an etsy shop to help raise funds for the Red Cross. I bought a wonderful skein of yarn through the site and encourage you to look through and buy something wonderful for yourself that helps others too. I did really well. On Thursday I actually got to go outside and walk around. I explored the neighborhood a little and found out that what I thought was a walking path was just a paved walkway to an electrical box, so it didn't really lead anywhere. I am glad that it is getting to be nice out, I want to figure out how long it takes me to walk to the corner store and back, or to the post office and back, and to the farmer's market and back so I can actually excercise and accomplish something at the same time! When I am alone and left to my own schedule I sleep less, I eat less, I do more. I accomplish things. I don't enjoy sitting and watching TV as much. I enjoy that I can leave a project consuming the living room for a week. What I don't get is that these are all things I can do when I am not alone- I just don't do them. Why not??? Because I don't want to wake up anyone? Because I don't want to inconvenience anyone? Because I don't want to make anyone think I am ignoring them? I don't know and I think that answering these questions will help me be a better person, will help me balance life and work in a better way. Due to my throat being so bad, I decided not to push talking for a half hour a day just to recite some Spanish. I listened to it when I could, but I knew my pronunciation would be off anyway, so I decided not to even try. I can't show you and it's KILLING me! 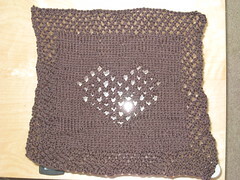 This project was made especially for me by Destiknit.. I was here muse... her inspiration... and... these are a gift... so I can't talk about them here...he/she may look...and I can't even post them up on Ravelry- the camera is taking a trip to England right now... the suspense is killing me! And a poncho. I was at lunch the other day with a friend and her daughter and it struck me that the little tot would like a poncho and that I had some yarn that she would love. So I promptly knit one up. I think I'll give it to her on her birthday in a few weeks. So since my next few big projects are gifts I won't have anything too fun to show you, but once I get done (today I am sure) with the one I am so excited about- then it is off to more scrubbers, and probably a scarf (which will be cool). So I started feeling sick again last Friday- just a scratchy throat. I thought It was the dry heat from a long car ride and a hot hotel room. I was wrong. by Saturday my glads were so swollen I couldn't touch my neck and I was on the road to being miserable. Sunday the glands were better (not perfect but I could at least touch them) and the sinuses were full. Monday my voice began to fail, Tuesday it was gone, Wednesday I went to the doctor and was told I had a virus and it needed to run it's course. Thursday I ignored it and did what I had to do, with little voice and lots of tissues nearby. Friday I started feeling better, still no voice. Saturday it began to come back and I could tell I was feeling better and Sunday it was almost (almost) gone. My voice is still scratchy. I still have some need for tissues now and again, and I cough every once in a while, a tickle that is hard to get rid of. Balance.. that is my top goal in 2009- Balance. Balance between home and work, balance between junk food and veggies, balance between friends and family... I am sure we are all the same, everything is tugging at us and the strongest tug often wins, even if it isn't what we really want/need to be doing at that moment. Answering that tug often leaves us feeling guilty about not doing something else, or sad about not doing something else. For me balance is often not found because I have an inability to say "no thanks". But I am getting better with that. I am sick again, doc told me to take a few days off from work, so instead I am working on the web site rather than being in the workshop. Plenty of things I can do at my desk, in my pajamas, and I can nap whenever I want. I was asked to do a workshop for children the week my mom comes to town. It would have been every day- I said yes, but that it has to be only 1-2 days. Mom will enjoy helping with the kids, and I get some income, but we don't loose the whole vacation. I am trying to do things in pieces rather than to sit and swallow them whole. Website- input three products a day till they are done- need to file- 30 things a day sounds like a good goal, clean the house- a room a week sounds good. Things are taking longer to get done but I don't have as much feeling of being consumed by one thing, and if I miss a day I don't feel as far behind, and I can do a little of everything- work, personal, domestic, every day. This new plan seems to be working. But I know my number 1-10, basic colors (even two shades of brown..), days of the week (I always forget Thursday) and months of the year (have so much trouble saying Septiembre). Also on the list was the months of the year and directions (now I can get lost in two languages) and time of day (morning, noon, etc.) as well as yesterday, today , and tomorrow. I have another hold.. might be another upper respiratory tract infection. I'm trying to fight it myself, but will go to the doctor Friday if it is no better. But that means I have lost my voice again, and my ears are plugged. This makes practicing hard, and even just listening difficult.. but I'll keep on with it. I need to put these lessons on my I-Pod so I can do this when I travel- already listen in the car on CD, but I'd rather not travel with the CD's. So on to Chapter 7. Greetings and weather. Great, at the end of this chapter at least I will be able to have small talk- even if the conversation is just 3 sentences. Last week I was in Virginia for two days- well, OK, more like 1 day, with a lot of driving down and back. My goal while I was there was to explore some local yarn shops. I have a book given to me that breaks down the US state by state and list local yarn shops, and there is knitmap.com that also lets you put in your zip code and look up shops. So I started in Harrisonburg VA. The first shop was closed-permanently. The second was much more a fabric store and had bags and bags of yarn what you couldn't open and feel, or get a good look at, and you had to buy the whole bag- not the way I want to shop for yarn. The Third place seemed like it would be interesting from their web site- but after I got there- driving down a long, unpaved road/driveway- I found a shop about the size of my shed- that was closed- and had no posted hours. Fancy web site for such a small operation. The fourth place also didn't exist any more, but just a few shops down in the strip mall, another yarn store had popped up, so I went there. I was drawn to a very interesting scarf and after the shop owner explained to me the pattern and technique (shibori), I bought a skein of yarn to try this for myself. I also got two sets of circular needles so I can try socks a new way, since in my last swap on Ravelry, my partner sent me a pattern for socks on two circular needles. That was it for the first day. I had driven around more of Virginia than I had expected to and it was time to do some more research. The next day I found the needle in the haystack- Cestari. what a WONDERFUL place. I drove there thinking that it wouldn't exist and as I got farther and farther into what felt like no man's land- I really worried that my trip would be in vain. But then I came up over a hill and there it was. I entered the large yarn barn and although the hours said it was open, and the door was unlocked, many of the lights were not on. But I poked around and looked at the wonderful yarn and sheep/lamb products they offer. I heard machinery start up in the basement and when I went there I saw that they spin their own yarns right there! Amazing! One of the workers had to shut down his machine to check me out because the cashier wasn't in yet. 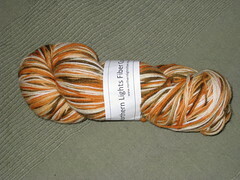 I bought a wonderful skein of yarn- hand dyed- just lovely. I was rejuvenated. this is the kind of knitter I want to be. I want to knit wonderful yarns from places where I can see the process and that I know I am supporting a local economy. I want hand spun, or at least hand dyed, from independent artisans that don't just do fiber- they live fiber. It was invigorating to find such a place, really, almost by accident. I went to one more yarn store on the way back, sadly after my last experience, everything seemed drab and commercial...I just couldn't bring myself to make a purchase- nothing inspired me. It is hard to start and keep up with a routine. Every time I get going something pushes me back. It is so much easier to be lazy than it is to work hard. But I enjoy the working hard and I enjoy the challenge of it too. What made it hard for me this week was that I went out of town on Thursday and Friday. I have to learn to not make travel and excuse for not exercising. I am going to be traveling A LOT the rest of 2009 and into 2010, so I need to get myself oriented with hotel work out rooms. I think some of it is embarrassment. I am not working out for a long time yet and I think that if someone is in there with me they would be thinking "what is the use of 10 min on a treadmill", but to me right now, 10 minutes is all I can stand without wheezing and falling over. really... I'll call it.."All but 6" and keep it private so no one can read it but me. I feel sometimes with the onslaught of technology that I don't have a place that I can truly vent about anything. This blog is a mix of personal and professional and certainly isn't the place to rant...I have great friends on Ravelry, but it is a public forum and not the place to complain about anyone in any way you wouldn't want them to read, and facebook certainly is the LAST place to air one's dirty laundry. Finally I am on to Chapter 6. The last 5 chapters have been wonderful with helping me learn some basic words and lots of pronunciation. But now I can learn some real vocabulary. Colors, numbers, months, week days, seasons, directions...all that important stuff. I think I did really well in Chapter 5. I have remembered most of the vocabulary and there are only a few words that I have a hard time pronouncing. 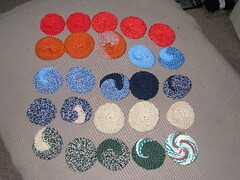 One thing that is hard about having a blog and writing about your knitting is that you have to be careful about gifts. If you are planning on knitting gifts for people who may read your blog- it may spoil all the fun posting pictures before the gift is given. What I can say now is that I have patterns for two of the coolest gifts a person could knit. One was made especially for me (well, it is available to others, but I was the inspiration behind it) and the other I was just given in a pattern swap. So for those of you who don't know or who just don't believe it- my Wii Fit gives you a pretty good work out. No it isn't for people who already work out a lot, or run miles and miles, but for people just getting into things, you can work up a sweat pretty easily and have fun while doing it. The step aerobics is fun, but I have trouble with the foot work still. The boxing is tough for the same reason- moving my feet and hands at the same time in opposite directions is like walking and chewing gum- tough for me. I like the hula hoop, and my stomach and abs hurt three days later after a 10 minute work out.